Pros: Laugh at the absurdity and then marvel at how it is all brought together. The date is 1939 and the location is the cavernous belly of a luxury liner crossing the Atlantic en route to New York. Our protagonist is B, who has found himself challenging the world champion to a game of chess. B, however, is four different characters of himself – and each tries to remember how he got there in the first place. In an exuberant performance, emerging theatre company Rhum and Clay cleverly explore one man’s mental anguish after experiencing total seclusion. Using beautifully inventive techniques they bring the story to life with shadow puppetry, physical theatre, dance and percussion. B remembers complex chess moves, but the memories of his own past are hazy, confused, and contradictory. Based on Stefan Zweig’s The Royal Game, 64 Squares was part of the Incoming Festival at the New Diorama Theatre. I have seldom been so impressed by the sheer ingeniousness and creative spirit of a performance. 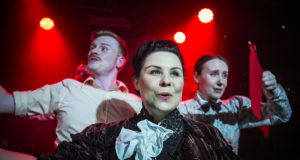 Without meaning to reach for hyperbole: 64 Squares is an utterly brilliant piece of physical theatre, where each absurd strand is brought together in the end to form one masterfully crafted whole – rather like a perfect game of chess, really. Performers Julian Spooner, Matthew Wells and Róisín O’Mahony, and Fred McLaren on the percussion – forming B’s four minds – were a delight to watch: playful and full of energy. The actors painted poignant caricatures of various characters through repetition and by mischievously exaggerating facial expressions and gestures. 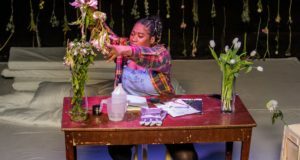 Despite the complexity of the script – which was delivered at a breakneck pace and often in sync – the performance felt polished and smooth, and I often found myself laughing out loud. The image of the three performers excitedly crowding around a wet jacket, tracing a lonely raindrop, McLaren on the drums craning his neck to see, was a visual and humorous treat. The use of percussion worked beautifully, combining jazz with dark undertones. 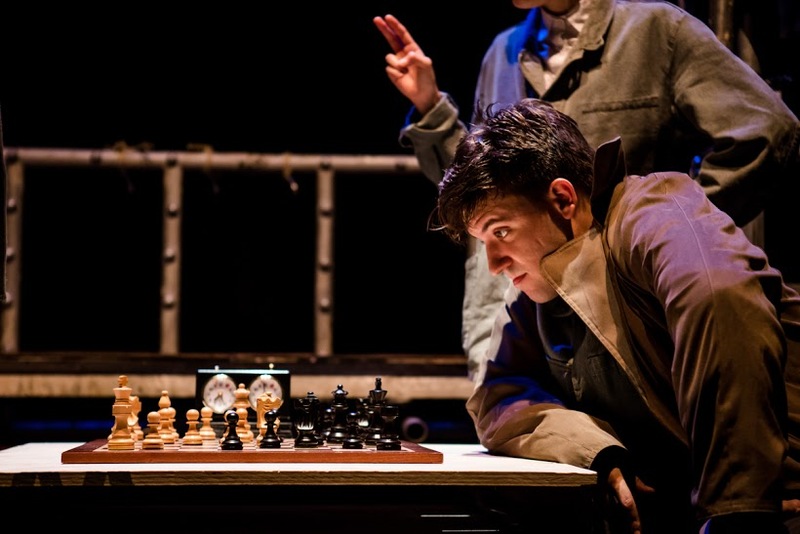 Similarly, the company cleverly played with light and shadow to create images and stories, which, given the topic being explored was ultimately chess, seemed particularly poignant. 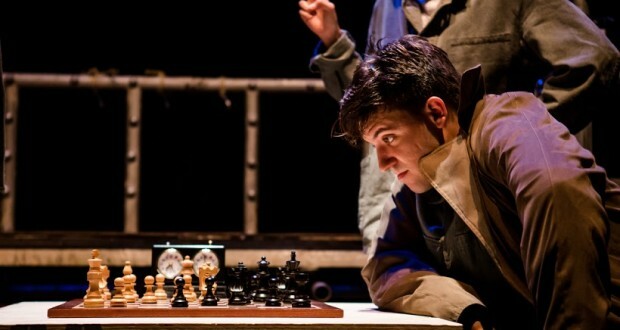 Overall, 64 Squares is one worth travelling up to the Edinburgh Fringe for – and you might pick up a winning chess move on the way.